Let’s face it. Barack Obama is no Ronald Reagan. The GDP grew at an anemic 1.3% in the second quarter. In the last two quarters the economy has grown at a rate of 1.8% and 1.3% . 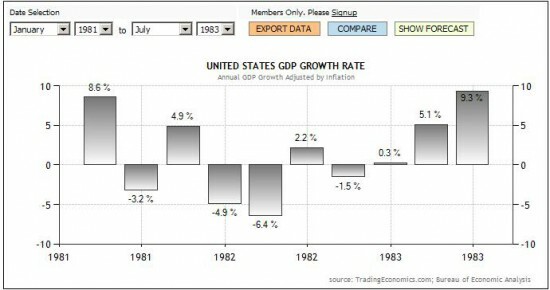 during the comparable quarters of the Reagan presidency in 1983, the recovering economy grew at 5.1% and 9.3% , respectively. It’s about time we all tell the Keynesians to go to hell, isn’t it? After blowing a trillion dollars on a failed stimulus plan, the US economy expanded at a slower rate than expected in the second quarter of this year. The Commerce Department announced this morning that the gross domestic product rose at an annualized seasonally adjusted rate of just 1.3% in April through June. 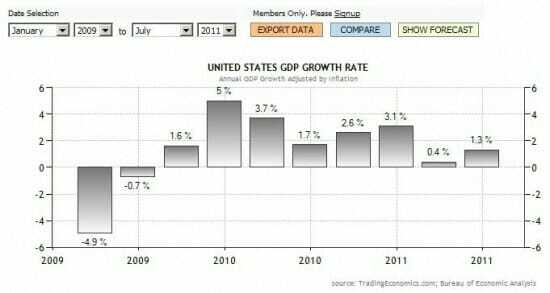 Economists surveyed by Dow Jones Newswires expected GDP to rise 1.8% in the second quarter. The first estimate of the economy’s benchmark indicator for the second quarter showed growth was supported largely by business investment and exports. But consumer spending, a big engine for the U.S. economy, made a much smaller contribution to growth. Spending edged up by an annualized rate of 0.1% in April through June, the weakest it has been in two years, after a 2.1% gain in the first quarter. Americans have had to spend more for gasoline amid higher prices, leading them to cut purchases for other things. Sales last month by U.S. retailers excluding car and parts dealers were unchanged, with declines reported by furniture stores; electronics and appliances stores; restaurant and bars; health care stores; and sporting goods, hobby, book, and music stores. Of course, today’s number was unexpected. UPDATE: BK informed me that the numbers are not correct – You gave Obama’s policies too much credit, the 4th q number was revised downward to 2.3% . That must be Bush’s fault too. Can’t wait until Nov ’12.